Trice Medical is a truly disruptive orthopedic startup with great potential. Trice is one of my favorite orthopedic startups. In the crowded world of “me-too” orthopedic technologies, Trice has carved out a niche with differentiated technology and is quietly changing orthopedics forever. I believe that MRIs will rarely be used for joint diagnoses in the future thanks to Trice. Back in 2016, I listed Trice Medical as a Hot Startup to Watch, then I interviewed the CEO, Jeff O’Donnell, in 2017. I predict that Trice will lead the world in the new category – Dynamic Imaging in Orthopedics. The other guys are doing static imaging. Trice’s technology enables the physician to “move” the joint while imaging in the doctor’s office. Trice’s technology is better, cheaper, more accurate. Physicians want it. Hospitals want it. And when given an option, patients prefer it. 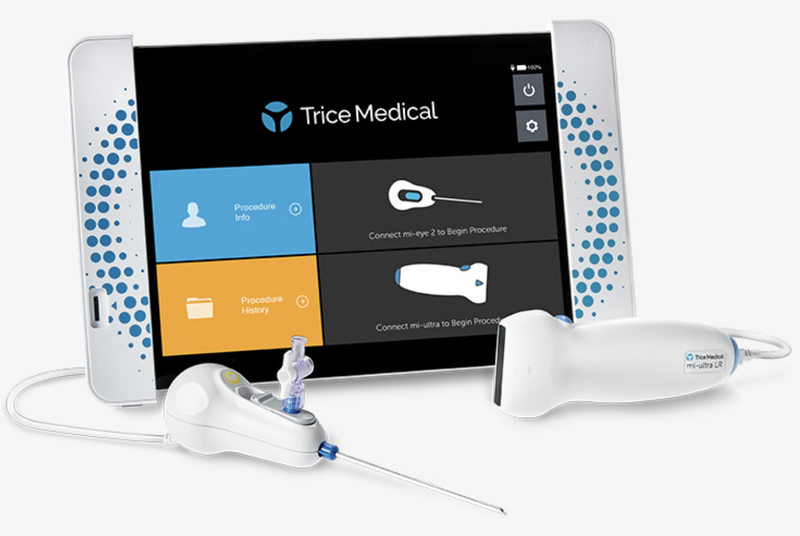 Trice Medical originally created a visual system called mi-eye that allows any orthopod to perform a diagnostic arthroscopy exam and diagnose any pathology in the intra-articular space. The current version is called mi-eye 2. This is a new movement driven by orthopedists. Social media is covered with physicians demonstrating how easy it is to diagnose joint issues by looking inside the joint in the convenience of an office environment. In the convenience of an exam room, they diagnose joint issues and discuss treatment options with the patient within 10 minutes. Trice Medical has just announced the combination of visual imaging + ultrasound imaging with the addition of the mi-ultra technology. This combination is called the Dynamic Imaging Platform. Mi-ultra enables the physician to diagnosis intra-articular and extra-articular joint issues in real-time in the office. The ultrasound wand is lightweight, connects to the same imaging tablet and help the physician diagnose joint injuries non-invasively. Mi-ultra can also guide the physician during injections.